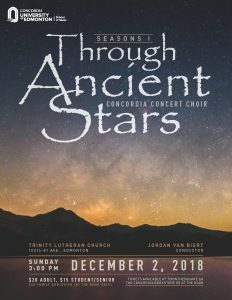 The closing arc of the circle of life, full of rich and tender imagery both sensory and spiritual, threads through this portrait of a waning season presented by the Concordia Concert Choir on Sunday. The poignance and universality of penitence and praise, comfort and peace is reflected in a mix of sacred and secular repertoire from across the Americas and Europe, including favourites by Brahms, Mendelssohn, Whitacre, Gjeilo, and Togni. 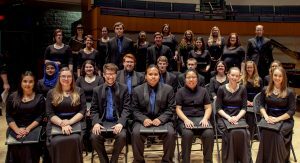 The Concert Choir, directed this year by award-winning conductor Jordan Van Biert, is comprised of 30 auditioned singers of university age from various disciplines and interests. Faculty/students/staff may pick up a complimentary ticket from the School of Music in Alumni Hall 306; tickets ($20 adults, $15 students and seniors) may be purchased in the Bookstore. Special family admission: $40 (immediate family, available at the door only).